Руководитель НИР и научный редактор А Н. Громцев. Петрозаводск: Карельский научный центр РАН, 2015. 190 с.
Forests and Their Multipurpose Use in the North-West Of the Borealzone of European Russia. / Research Coordinator and Scientific Editor A. N. Gromtsev. Petrozavodsk, 2015. 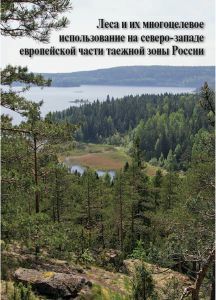 190 p.
The book is a systematic summary of the extensive data that consistently characterize the natural features, land use scenarios, current state and the resource potential of forests in the North-West of the boreal zone of European Russia. The studies have relied upon the original classification and map of geographical landscapes based on the zonal typology principle. Current understanding of so-called ecosystem services is represented. As a result, forest zoning by priority forest uses has been performed as applied to Karelia.